I have written about many Indian festivals, but never about Holi. 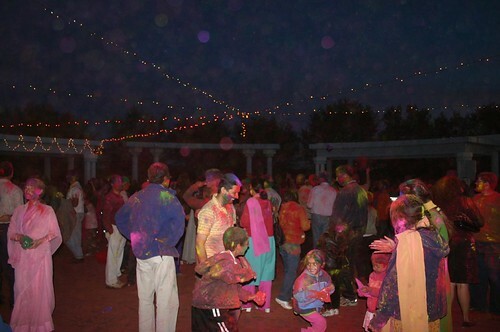 It is the Hindu festival of colours, much like Diwali being the festival of lights. For Sikhism, colours are strong depictions of mental state. There is no physical relevance to colours. A Sikh is expected to wear ordinary clothes that do not attract attention. Neither is playing with colours encouraged. When my mind is attached to Him, I am dyed in the deep crimson of His Love. In the daily Sikh prayer, the first reference to the word colour appears in Japuji Sahib. it can only be cleansed by the colour (Love) of His Name. Sri Guru Granth Sahib recognises two colours: Kusumbh and Majith. Kusumbh is light orange in colour, while Majith is dark red, even crimson. Kusumbh is the color of a flower (Butea monosperma) called “flame of the forest” (called FF henceforth in this post). When its immersed in water for a few hours, the flower looses its colour, and the water becomes coloured. As the colour of FF flower is impermanent and is washed away in water, likewise the colours of religiosity are also temporary. The self-willed manmukh is like the false color of the FF flower, which fades away; its color lasts for only a few days. The Lord’s Love, found in the Sat Sangat, the True Congregation, is absolutely permanent, and colorfast. Meeting with the Blessed Guru, one is dyed in the color of the Lord’s Love, imbued with this deep crimson color. One is dyed in the (red) color of the Lord’s Love, by great good fortune. He finds God, the Giver of peace, with feelings of joy. Old age and death cannot touch him, and he shall not suffer pain again. Dear HARDEEP,a very scholarly piece on the subject matter and the choice of shabads from Shri Guru Granth Saheb ji,is very apt.The significance and importance of 2 colours- Kusumbh and Majith,in Sikhism,has been very aptly explained ! GBU ! Keep it up !